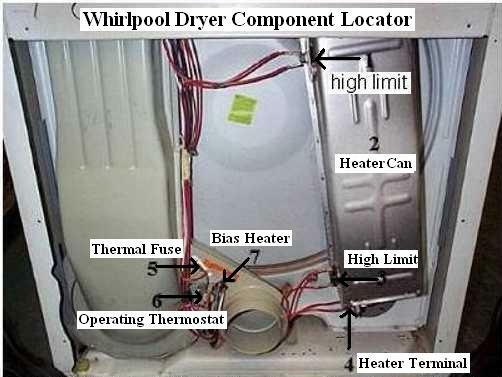 Is your Whirlpool dryer not running? Fortunately for you this dryer repair guide will walk you through the steps in repairing your dryer. These are the same steps I take in repairing dryers professionally. So read each section carefully until your dryer is repaired. The thermal fuse is the most common problem with Whirlpool dryers not running. The thermal fuse cuts the dryer off in the event it overheats. The vent being stopped normally causes dryers to overheat. So if your thermal fuse is bad you should check the vent. To check the thermal fuse, first unplug dryer and remove back. Once the back is off you should be able to see the thermal fuse, it is white and located in the bottom on the left hand side. Now unplug the two wires using your ohmmeter check to see if you have continuity between the two terminals, if not the fuse is bad and needs replacing. Thermal fuses can be purchased at AppliancePartsPros.com. 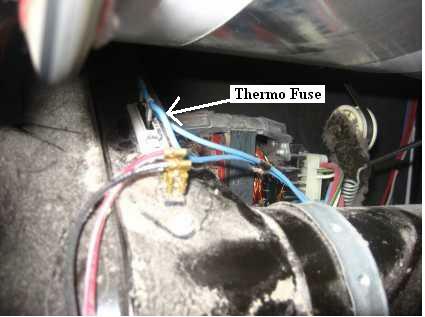 If your thermo fuse is bad read the two sections below on the operating thermostat and the heating element. The vent being clogged is the most common cause for the thermal fuse to blow however, there are two more possibilities that you may have to consider especially if you replace the thermo fuse and it blows again. 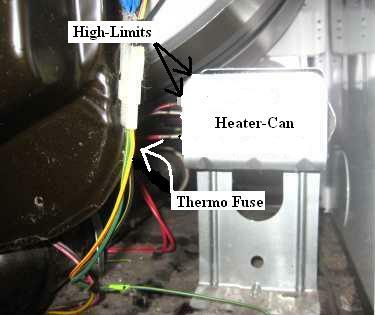 The operating thermostat controls temperature in the dryer and occasionally they can stick closed causing the temperature to steadily clime eventually tripping the thermo fuse. So if the thermo fuse is faulty it may cause the thermo fuse to fail. The heating element is a coil of wire; sometimes this coil of wire will warp out of shape and touch the metal heater-can. When this happens the heater will heat all the time even when the dryer is off. This will cause the thermo fuse to trip. This is very dangerous and should be checked anytime the thermo fuse is blown. See this page for instructions on checking the heating element. Whirlpool Dryer No Heat See the section titled “element grounded out”. Locator view for models with the heater compartment on the back (back can be removed). Locator view for models with the heater compartment under the drum (back cannot be removed). The door switch cuts the dryer off when you open the door. First unplug the dryer then take the lint filter out and remove the two screws that are under the filter. Then pull the top forward and lift up on it. The top should lift up and once the top is up you should be able to see the door switch. Now after making sure the door is closed, remove the wires from the switch. Then using your ohmmeter ,check to see if you have continuity between the two terminals. If not, the switch is bad and needs replacing. Door switches can be purchased at AppliancePartsPros.com. The motor can cause Whirlpool dryers not to run. Motors can be hard to check and I don’t recommend trying to do so. But if the motor hums when you turn the dryer on, then cuts off after 30 seconds or so. This normally means the motor is bad and needs replacing. However if there is something in the fan blade blocking it from turning this may cause the same problem. So check this before replacing the motor. Motors can be purchased at AppliancePartsPros.com. The timer can cause a Whirlpool dryer not to run, although I rarely see this. The procedure for checking the timer varies with every model. But i can say that if you check everything on this page and don’t find anything wrong the timer is a good possibility. Timers can be purchased at AppliancePartsPros.com. The start switch is a momentary switch that temporary makes contact completing the circuit to the dryer motor allowing it to start running. Once the motor has started the centrifugal-switch in the motor trips and takes over for the start switch completing the circuit to the motor, allowing the motor to continue running. This motor switch continues to make the circuit until the motor comes to a complete stop. The start switches don’t fail often in fact they fail so little I almost left this section off this page but I decided since the start switch is a possibility and it is fairly easy to check I added this section. To test the start switch follow the steps below. 1. Disconnect the power to the dryer. 2. Locate the start switch by removing the back of the control panel. 3. Disconnect the wires off the start switch. 4. Place the leads of your ohmmeter across the two wire terminals on the switch. 5. 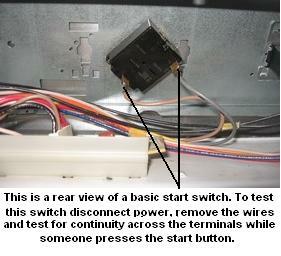 Test for continuity while you have someone press (or turn) the start switch. The circuit should read open with the switch in the normal position and it should read closed when the switch is pressed (or turned). If not replace the start switch.